I have joint custody of waffle iron with my cooking partner-in-crime, Yasmina. I think its a brilliant idea to share small appliances and kitchen gadgetry that you wouldn’t use every day, like juice extractors, spiralizers and waffle irons. She originally made the purchase of the waffle iron a few years ago for our restaurant day adventure together where we made chicken and waffles. And while the combination was awesome, I’m almost certain that her neighbors still curse me for filling their courtyard with the smell of fried chicken for the greater part a summer day when it was far too hot not to leave your windows open. And lately, while Yasmina has been in a self-induced chocolate reverie, which you should definitely check-out on her blog (here), I’ve been knee-deep in my own musings about things I could make in our waffle iron. I’ve tried hash browns, which were enjoyable, but not my thing, as I much prefer making them in a pan. Lately, I’ve fantasized about making french toast and cinnamon rolls with the waffle iron, an endeavor for which I might have to wait for my gluten-free abiding husband’s next business trip to conquer, when I can enjoy gluten without restraint or concern that he might feel he’s missing out. One thing I love making in the waffle iron are these croutons. 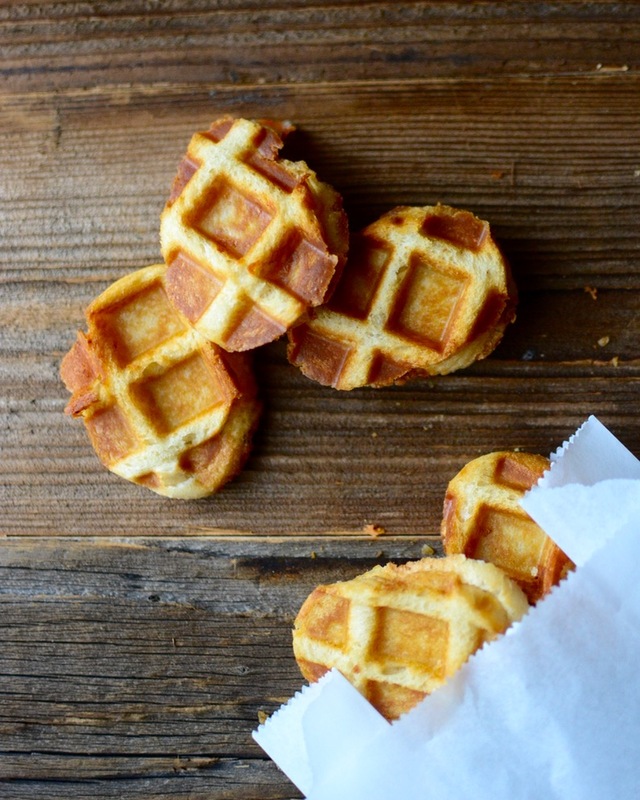 They’re basically miniature, crunchy grilled cheese sandwiches in waffle form. What’s not to love? Everyone goes crazy when they see and taste them. I most recently made these to go with my Tomato Basil Soup, which you can read about here. Forgive me for not providing exact measurements here, as so much of this depends on several factors. For example, since baguettes will vary in size, you may find that you might need more than baguette. The texture of the baguette will also vary. You'll want one that is dense, which will help keep the cheese from oozing from it when it's cooked in the waffle iron. Based on my ingredients, I was able to get about 20 croutons. Then, sandwich a piece of cheese between two pieces of baguette. You might need to break off the cheese to fit it to match your rounds. To cut down on mess, it is best to make sure that the cheese doesn’t stick out from the little sandwiches since they are going into the waffle iron. Then, brush the melted butter both sides of the little cheese sandwiches and place them in the waffle iron. Cook them for about 1 – 2 minutes, depending on your iron. Place the finished “croutons’ onto a clean baking tray and continue on with pressing the sandwiches until you have as many as you need. 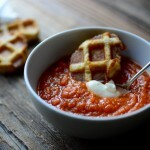 Serve them with soup or a salad, like my Tomato Basil Soup, which you can find here. You can make these earlier on the day that you want to serve them and store them in an airtight container.